1814 (Nov. 20) Canton, China to Boston, Mass. via Saybrook Ct., dateline on folded letter with "Canton Novr 20th. 1814" to Boston Mass., endorsed "Favd. by Capt. 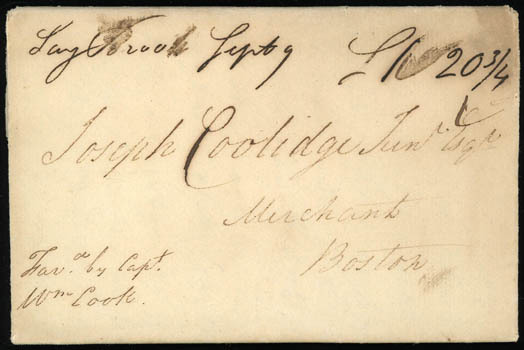 Wm Cook", entered mails after 9 months at sea with manuscript "SayBrook Sept 9" 1815 postmark and matching "Sh 20¾" war surcharge rating for 18¾¢ inland postage (12½¢ plus 50% war surcharge) plus 2¢ ship fee, Very Fine. 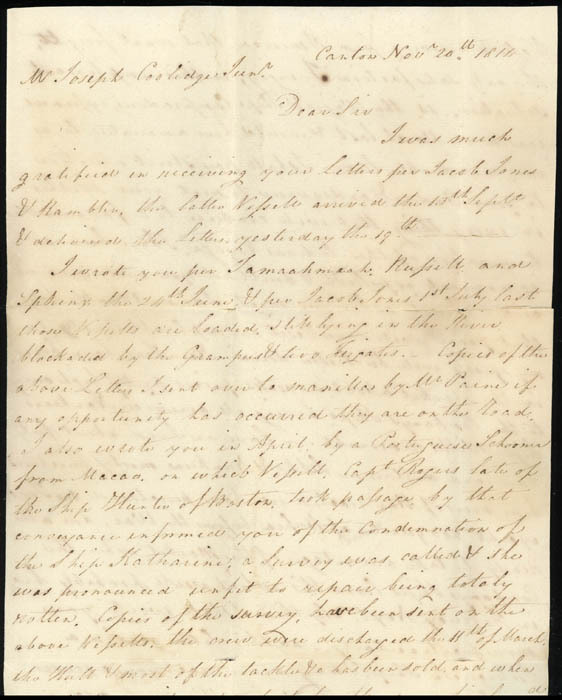 AN EXCEPTIONALLY EARLY AND RARE INCOMING LETTER FROM CHINA TO THE UNITED STATES DURING THE WAR OF 1812 DESCRIBING THE TROUBLES OF WAR AFFECTING THE FAR EAST TRADE. Interesting letter from Canton showing the difficulties of Far East mail conveyance and multiple copies needing to be sent, "I was much gratified in receiving your Letters per Jacob Jones & Rambler… I wrote you per Tamaahmach, Russell and Sphinx the 24th June, & per Jacob Jones 1st July last, those vessels are loaded lying in the River blockaded by the Grampus & two Frigates. Copies of the above Letters I sent over to manilla by Mr Paine if any opportunity has occurred they are on the road. I also wrote you in April by a Portuguese Schooner from Macao on which Vessel Capt Rogers of late of the Ship Hunter of Boston took passage by that conveyance informed you of the Condemnation of the Ship Katherine, a Survey was called & she was pronounced unfit to repair being totaly rotten… In case of peace, the only Vessel in this River on which I could ship your property was the Meridian late Capt. Woodward. But that vessel, only four years old, two of which she has been on this river, is completely rotten & will certainly be condemned…I hope that peace will soon visit our deplorable County, or my spririts will be broken down…have on hand about forty thousand dollars in Silks & Nankeens mostly purchased before news of War reached us. have purchased no Teas except 200 quarters of Bohea before the War…I write you now particularly - as this letter goes in a Portugese Ship & may never reach you… Wm. Blanchard". 1820 (Aug. 5) New York N.Y. to London, England, datelined folded letter with bold strike of red "Ship.Atlantic * W. Matlock * Sailed Octo. 6." 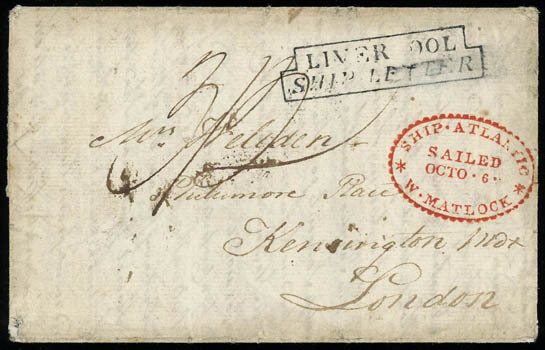 fancy oval handstamp, "Liverpool / Ship Letter" framed handstamp and manuscript "3/2" 3s2d due rating for double rate letter (2x 8d ship letter, 2x 11d inland), reverse with London (11.3.1820) arrival backstamp and London Penny Post datestamp; some edge wear, Very Fine and choice strike of this rare ship handstamp. 1835 (Mar. 21) Malaga, Spain to New York N.Y. via Philadelphia, datelined folded letter endorsed "p. Franklin via Philadelphia", entered mails with red "Phila, 10 May" octagon datestamp and matching Full-Rigged Ship octagon handstamp and "14½" cent rating for 2¢ ship fee plus 12½¢ inland postage to New York, choice and Very Fine, ex-Vernon Morris Jr.; with 1997 P.F. certificate. (Hudson Bay Company) "En Route, August 7th, 1838" to London, England, datelined folded Autograph Letter Signed with integral address leaf of A.M. McLeod written while with the Hudson's Bay Co. canoe brigade express traveling from Fort Chipewyan on Lake Athabasca to York Factory on Hudson's Bay via Norway House to Chief Factor John Stewart in London, carried by H.B.C. 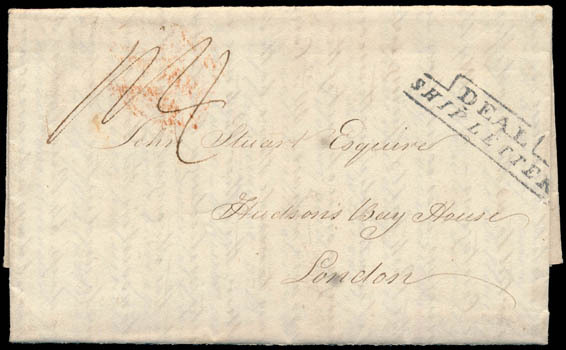 ship to England arriving with stepped "Deal/Ship Letter" handstamp and manuscript "1/4" (1s4d) due rating for 8d ship letter fee plus 8d inland postage from Deal to London (74 miles), red London "18 Oc 1838" backstamp, fresh and Extremely Fine, ex-de Volpi, Risvold. The autographed signed letter from Alexander Roderick McLeod, a Chief Factor with the Hudson's Bay Co. in charge of the Athabasca district when this letter was written, comments on the year's poor results due to a bad season and, "…there is still a much greater evil lurking about, i.e. the small Pox, it has (caused) awful ravages among the Plains Tribes in the Saskatchewan…vaccination has been resorted to, as the most effectual means of avoiding the Contagion…it is considered expedient that I should see most of the Post fall & spring, which I admit is very proper, but it is attended with inconveniences, arising from my being so much out of the way, when the Expresses pass and repass…". 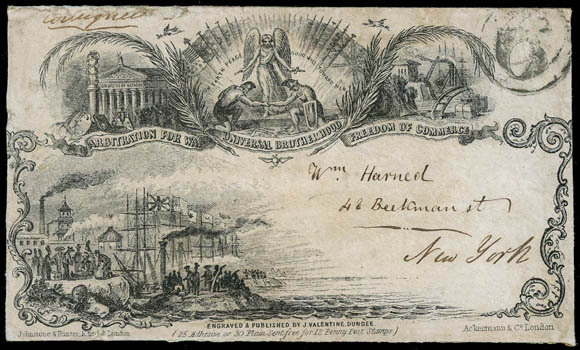 1840s Great Britain to New York N.Y., "Consignee" endorsement on Arbitration of War, Universal Brotherhood, Freedom of Commerce engraved illustrated envelope with J. Valentine Dundee imprint, carried transatlantic as a consignee's letter, entered the mails with New York "6" in circle due handstamp for an incoming ship letter to the port of arrival; some faults and slightly refolded, Very Fine appearance, a rare used transatlantic example of this J. Valentine Dundee peace propaganda design. 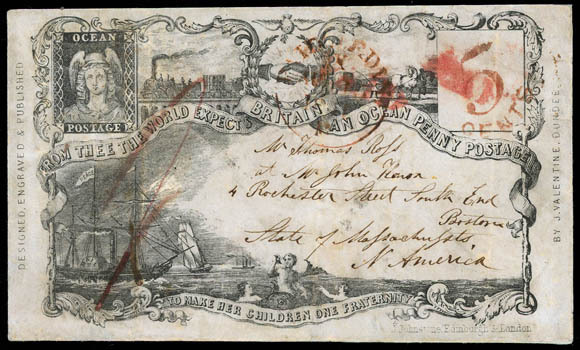 1851 (Aug. 14) Edinburgh, Scotland to Boston, Mass., red "Paid at Edinh AU 14" origin postmark with red manuscript "1/-" shilling prepaid rating on Ocean Penny Postage illustrated propaganda design envelope, State 5a, J. Valentine imprint at left, Johnstone imprint at bottom, Liverpool (8.16) backstamp and matching red "5/Cents" credit handstamp to U.S., carried by Cunard Line Asia from Liverpool Aug. 16th to New York arriving Aug. 28th, red Boston "Paid" handstamp at top right; cover slightly restored, Very Fine appearance. A REMARKABLE OCEAN PENNY POSTAGE PROPAGANDA USED TRANSATLANTIC TO THE UNITED STATES. 1859 (Feb. 18) Camp Floyd, Utah Territory to Dublin, Ireland, choice strike of rimless "Camp Floyd, U.T., February 18" cds and matching "Paid 3" in arc overwritten with manuscript "24" rating at upper right on buff cover to Dublin, Ireland, New York reddish black "19" credit handstamp, carried by Cunard Line Asia from New York Mar. 30th to Liverpool arriving Apr. 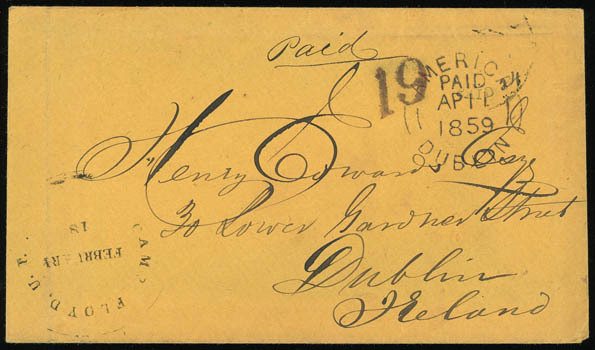 10th, sharp strike of "America, Paid, Dublin, AP 11 1859" (Robertson P1) arrival datestamp for late mail closed bag from Liverpool; vertical file fold at left, Very Fine and choice. AN EXCEPTIONALLY RARE CAMP FLOYD UTAH TERRITORIAL TRANSATLANTIC USE WITH A CHOICE STRIKE OF THE RIMLESS POSTMARK. The letter likely traveled East from Camp Floyd by stage or horse via the Salt Lake City to St. Joseph route, where it then went to New York by rail. It left New York Mar. 30th on the Cunard Line "Asia", arriving at Liverpool Apr. 10th. From there, it went by rail to Holyhead, across the Irish Sea by boat, to Dublin. 1861 (Jan. 19) Boston Mass. 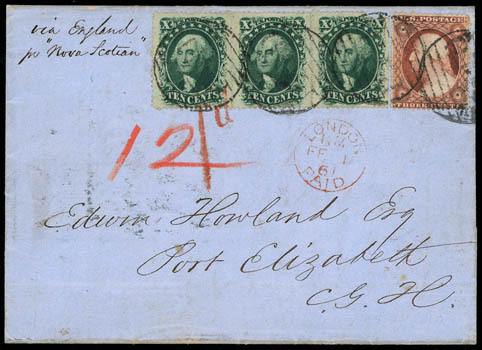 to Port Elizabeth, Cape of Good Hope, blue folded letter bearing 10¢ green (35) strip of three, s.e. at right, and 3¢ dull red (26), all tied by Boston "Paid" grid cancels prepaying the 33¢ British Mail rate via Plymouth, "Boston Am. Pkt. Jan 19" exchange backstamp and red crayon "12" cent credit to G.B., sent by closed bag through Portland, carried by Allan Line Nova Scotian from Portland Jan. 20th to Liverpool arriving Feb. 1st, red London Paid (2.1) transit cds and red "1d" colonial credit handstamp, then by Union S.S. Co. Celt from Devonport Feb. 6th to Cape Town arriving Mar. 15th, reverse with red Cape Town (3.15) rimless transit and red Port Elizabeth (3.19) oval arrival; right 10¢ with nick, otherwise Very Fine. 1863 (Dec. 10) Spalding, England to Chillicothe Oh., orange cover bearing G.B. 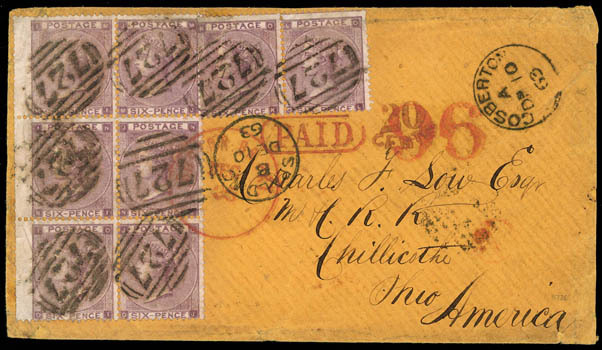 6d lilac (SG 84) sheet-margin block of 6 and horizontal pair, cancelled by "737" barred numerals, Spalding (12.10) and Gosberton (12.10) cds, London red "20/Cents" credit handstamp for quadruple U.S. inland postage, carried by Cunard Line Asia from Liverpool Dec. 12th to Boston arriving Dec. 24th, red "Boston Br. Pkt. Dec 25" exchange cds with matching framed "PAID" and the "96" credit handstamps, Very Fine. A STUNNING QUADRUPLE RATE TRANSATLANTIC COVER BETWEEN TWO SMALL TOWNS. 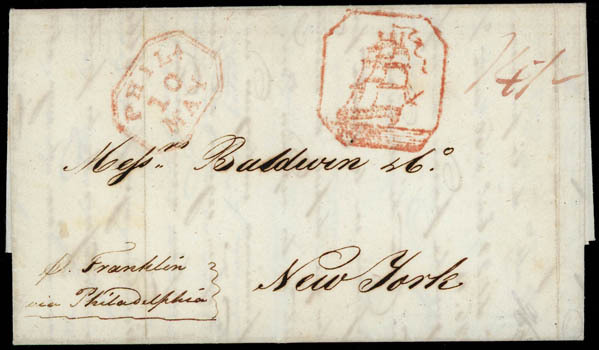 1864 (Dec. 22) New York, N.Y. to Hng Kong, China via London, cover bearing 1¢ blue (63), 3¢ rose (65), 5¢ brown (76) and 12¢ black (69), each stamp tied by NYFM crossroads cancel, "New-York Br. Pkt. Dec 22" exchange backstamp and magenta "48" credit, carried by Cunard Line Canada from Boston Dec. 23rd to Queenstown arriving Jan. 4th, red London Paid (1.5) transit and red crayon "1" pence colonial credit, blue "Hong-Kong, FE 25, 64" arrival backstamp, apparently sent back to London in care of forwarder, small cover repair at top left, Very Fine and attractive. 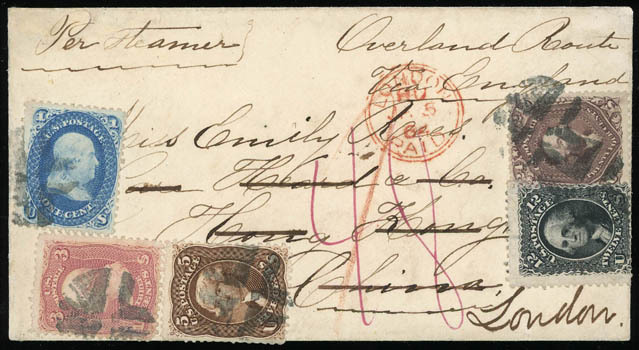 A SPECTACULAR FIVE-COLOR FRANKING OF THE 1861 ISSUE TO HONG KONG AND FORWARDED TO LONDON. 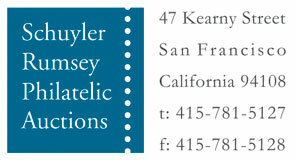 At the time of mailing, there was a 45¢ rate via Southampton and a 53¢ rate via Marseilles. The 45¢ franking indicates the cover was fully paid for the route via Southampton, but the magenta "48" credit indicates that the cover was treated as fully prepaid for the route via Marseilles. The best explanation is that the New York exchange office sent the cover to Boston to make the Cunard sailing on December 23, 1863, and the miss-rating was overlooked. In Southampton, the letter was put in a closed mail bag and sent overland to Marseilles, France. At Marseilles, the letter departed Jan. 13th on the P&O Line "Vectis", arriving at Alexandria, Egypt Jan. 19th. From there, it went overland to Suez where it departed Jan. 20th on the P&O Line "Mooltan", arriving at Galle, Ceylon Feb. 5th. There, it changed ships and left Feb. 5th on the P&O Line "Orissa" arriving in Hong Kong Feb. 25th 1864.